When the cold winter passes and warm spring days give way to the heat of summer, there’s nothing better than heading for a day outdoors. You prepare your food, buy your drinks and pack your cooler, but which are the best ice packs for keeping it all cool? You’re going to want to make sure the treats you’ve prepared will stay cool as long as possible. After all, there’s nothing worse than settling down for a nice lunch by the lake or on the beach, and finding soggy sandwiches and warm drinks. This can spoil your day, leaving you thirsty, hungry and heading for home much sooner than you wanted. In this article, we take a look at what to expect and look for in an ice pack, and how they compare to using regular ice. We also review what we think are some of the best ice packs for coolers available on the market today. What is a Reusable Ice Pack? Reusable Ice Packs Vs Regular Ice: Which is Better? It speaks for itself, and the clue is in the name. It’s an ice pack you can use time and again. They can be frozen before each use and, as long as the outer packaging remains intact, can be used again and again, and will last for quite some time. Their most common use is for inside food and beverage coolers, such as the ones we describe in our guides to the best patio coolers, or the best soft side coolers. They contain water and generally some other additives to increase viscosity, such as a refrigerant gel. These contents are often blue in color so you can see them clearly if you have any leakage. If you find blue sandwiches in your cooler, throw them in the trash! Do you remember the soft blue ice packs your Mom used to put in your Spiderman or Barbie lunchbox for school? I used to like squishing them – turns out this was not a good idea. The gel was petroleum based and could cause illness if ingested. The Consumer Product Safety Commission recalled most of these packs eventually. Many companies now make ice packs from environmentally friendly, non-toxic, chemical-free products. They also focus on phase change materials, which are non-toxic and biodegradable. Now for a bit of science. A phase change material (PCM) is one that changes from a solid to liquid state when it absorbs heat. Once it changes its state or phase, it then holds onto that heat and stores it as energy. Eventually, it fully melts and releases the heat at a normal level again. The advantage of a PCM is it really does lock down the heat. The whole ice pack has to reach its melting point before the phase change begins. It then holds the latent heat until it’s fully melted – this means less heat in your cooler. Other ice packs, replacing the more toxic traditional style ones, are foil packs. They contain a refrigerant gel within layers of nylon and foil. Initially designed for keeping blood at a constant temperature during transportation, this technology has now hit the ice pack for coolers market. Similar to a phase change material, they keep the heat they absorb, and help your coolers stay cold. Ice packs have a couple of advantages over regular ice. They will stay frozen for longer, and they won’t leave your cooler swimming in water. The last thing you want on a sunny day out is hot juice and saturated snacks at the bottom of the cooler. Regular ice is easier to pack around canned or bottled drinks and might take up less volume than a reusable ice pack. However, it does melt quicker, making it not so good for food storage. Using a combination of reusable packs and regular ice is always an option. This gives you the best of both worlds. 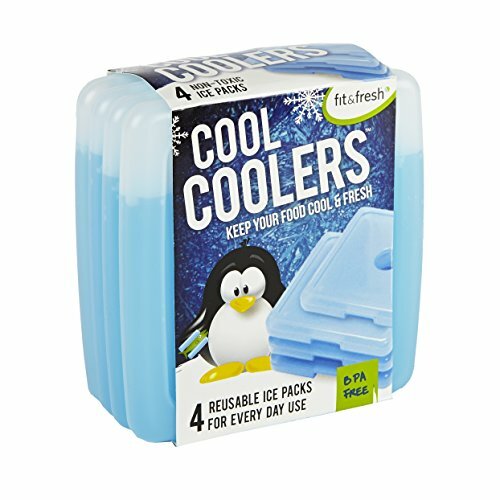 The cool packs will help your ice stay frozen longer, keeping your cooler’s internal temperature lower; sometimes for up to twice as long. Plus, if you take cups, you can use the ice in your drinks. Smaller reusable ice packs are great for adding to lunch bags, bento boxes and other small insulating bags. They’re also ideal for use when grocery shopping, keeping frozen goods from melting on the trip home. Another thing to consider is cost. Buying regular ice and having to keep replacing it can work out expensive, especially if it’s a regular purchase. You’re basically paying for something which just melts and is then thrown away. Reusable cool packs can last for several years, so while the initial outlay is going to be more, they will quickly pay for themselves over time. Just rinse them and pop them back in the freezer after use, ready for next time. Which to use all comes down to a matter of personal choice in the end. Regular ice might be better for beverages, from a packing point of view. Reusable ice packs can be better for perishable goods: they don’t leave the bottom of your cooler looking like a filled bathtub. Either way, reusable ice packs will not defrost as quickly as regular ice. It’s also worth noting there are some that can fit into gaps or are pliant enough to be molded around the items in your cooler. Below are some considerations you need to think about when choosing an ice pack for your cooler. Take your planned activities into account when choosing your ice packs. Do you want them for a weekend of camping, fishing or hunting? Will they just be used for a day at the beach or a tailgate party? Do you just need something to keep the kids’ lunch cool? Different ice packs will last for varying lengths of time. Make sure you choose one that will stay frozen for as long as you need. Some will last from four to 12 hours, and others will stay cold for up to 48 hours or more, in ideal circumstances. You need to make sure you have enough room left in your cooler for all the food and drink you want to keep cold. Think about how much space your ice packs are going to take up. Look at the height, width, and depth. Remember, most won’t fill uneven gaps in the same way regular ice will. Fortunately, there are flexible options available for smaller coolers or odd spaces, and slim ice packs for lunch boxes. Depending on the size and freezing agent in your ice pack, the weight can vary greatly. If you might need to carry your cooler for long distances, from the car to the riverbank on a fishing trip for example, this is definitely something to consider. Of course, if you’re buying ice packs for use inside wheeled coolers, then weight is less of a consideration. The other consideration here is how much regular ice they replace. A pack that weighs just a few pounds will be more efficient at cooling as the same weight of regular ice. It will also take up much less space, last longer and leave no mess. Some ice packs have a flexible outer casing, while others have a hard shell. If you know your cooler is likely to take a bashing when you’re out fishing or hunting, you’ll want your ice pack to be durable and strong. This will help prevent breakages and leakages. Softer casings, particularly for gel-filled packs, will be better for packing around irregular shaped goods or filling smaller gaps in your cooler. Just like anything else in life, a higher cost usually means better quality. A cheap ice pack might seem a good option when you buy it but may not last very long. My advice is to buy the best cooler ice packs you can afford. A good quality ice pack will likely last much longer and actually cost you less in the long run. Even the most expensive ones won’t break the bank but are less likely to need replacing. Most hard cases are plastic and will withstand knocks and impacts. Make sure to look for cooler packs that are BPA free. BPA is an abbreviation of Bisphenol A, a chemical that is sometimes used to make plastics. It has been shown to have adverse effects on health, such as fertility and cardiovascular issues. Hard casings are likely to last longer than some softer foil and nylon options, although they’re not as flexible. We have mentioned that the use of petroleum-based products for ice packs is now not general practice. However, there are still some out there, so check the labels carefully before purchasing. If it’s labeled as non-toxic, it indicates it is safe, free from poisons, and won’t cause health issues when used as intended. If you are unsure, check out the product contents and the manufacturer. Something labeled as non-hazardous means it should not contain chemicals, solids, liquids or gases which are a danger to you or the environment. This might also be labeled as chemical free. Products which are sustainable or environmentally friendly will generally have little or no impact on our ecosystems or environments. Here are our top picks of some of the best high-quality reusable ice packs for your cooler. Depending on how long I plan to be out and about decrees which size cooler I will take. If it’s a day trip fishing at the lake, I take a small one, but if it’s a weekend away with the family, of course I need a larger cooler. These ice packs come in two sizes, making them ideal for either size cooler. Apart from two sizes, these gel packs are also available in two different styles: a zip closure which then irons closed, or a screw cap option. Both variations are delivered with dry contents. You simply add the directed amount of water to form a gel, then remove any air before sealing them shut and freezing. Be aware that it can be a little tricky to expel all the air from the bag before sealing. The mid-size comes in packs of four and the large size in packs of three. This means you can find the ideal size for your cooler and just use however many you need. The pack is made from three layers of aluminum, known for its ability to transfer heat, reinforced with nylon which is 8 millimeters, or 0.32 inches, thick. They are durable and will last for hundreds of cycles of freezing and thawing. They are also flexible, making them easy to pack in between items in your cooler. 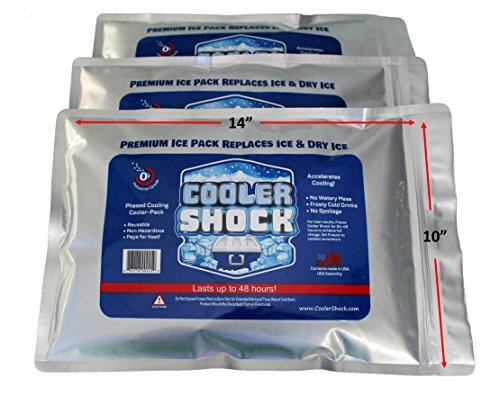 Two pounds of cooler shock will cool the same as three pounds of ice and can stay cold for up to 48 hours, making them suitable for weekends away with your cooler. The phase change temperature of these cooler packs is 18 degrees Fahrenheit, helping to accelerate the cooling of your beers, water or food. After use, pop them in your freezer for 24 hours and they will be ready to go again. The company is so confident in their product they offer a 6-month, 100 percent money-back guarantee. The larger of these ice packs is 10 inches by 14 inches and 1.5 inches thick. The mid-size pack is 10 inches by 10 inches and 1-inch thick. The weight and cooling capacity of this smaller pack is approximately half of the larger size. Apart from that there is no difference. Use the bigger ones for a larger cooler and the mid-size ones to either fill in gaps or in smaller coolers. Two pounds of weight replaces three pounds of ice. Keeps cool for up to 48 hours. Two sizes and styles to choose from. Easy to fill and seal. Known to last for over 300 freeze/thaw cycles. Can possibly puncture if all the air isn’t expelled before sealing. Some users find them a bit fiddly to fill and seal. 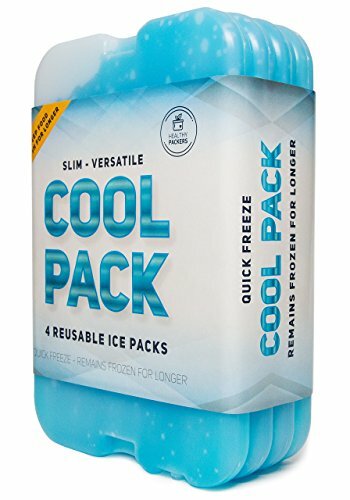 These large ice packs could be the solution you are looking for to keep the contents of your cooler as they should be?cold. The Yeti name conjures up rugged outdoor trips fishing on the lake with one of the company’s sturdy coolers in hand. 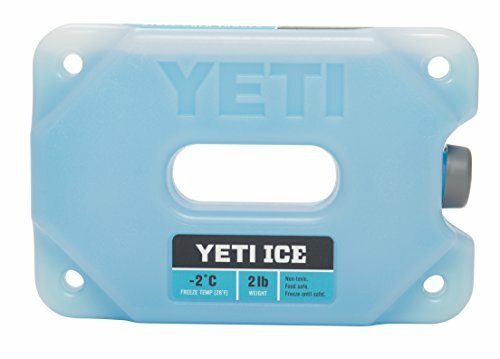 Yeti also make ice packs to keep those coolers working at their optimum levels. This ice substitute won’t leave your food warm or floating on a bed of water. Just like Yeti coolers, these refreezable ice packs are built to last. The impact-resistant hard casing will withstand most things you throw at it during your outdoor adventures. This ice pack is custom shaped to freeze quickly – it is oblong with a hole in the center. The specialized shape means you can put it in the freezer for just a few hours and it will be ready for use quicker than other products. The Yeti packs come in three sizes, 1 pound, 2 pounds and 4 pounds, giving you a choice of sizes for your cooler. Yeti even has a calculator on the website which lets you work out what size ice packs and how many you need for your Yeti cooler. If you have another brand of cooler, you could find a similar size in the Yeti range and calculate what size would be best. The packs can be used alone or as an addition to regular ice, to keep everything in your cooler at a nice low temperature. 1 pound pack measures 8 inches by 2.63 inches by 1.63 inches. 2 pound pack measures 8 inches by 5.38 inches by 1.63 inches. 4 pound pack measures 10.75 inches by 8 inches by 1.63 inches. Works better when used in conjunction with regular ice. Can begin to lose its chill after about four hours. Lunch boxes and small coolers don’t leave a lot of space for ice packs. A slim design would be perfect, allowing yours or your child’s packed lunch to stay cool and fresh. Cool Coolers come in a pack of four, each measuring 4.75 inches by 4.75 inches by 0.25 inches. This is a good size to fit into smaller cool bags or lunch boxes. You could even stack them together to keep food and drinks cold in a larger cooler. They have grooves cut into the design to make stacking easier. The outer coating is strong and durable, encasing the gel filling. You can freeze them every night and put them in the family’s packed lunches the next day. It seems these ice packs are pretty much bullet-proof and will last for a long time. These ice packs from Fit & Fresh are BPA free and non-toxic, so they are entirely safe to pop right next to your food. You can use the packs in any insulated bag. Keep your drinks cold for the gym, use them for transporting baby food and bottles, or stack them high in a cooler when you’re tailgating. Measures75 inches by 4.75 inches by 0.25 inches. 100 percent non-toxic and BPA free. Weighs 1 pound for a pack of four, so about 4 ounces each. Fits all types of lunch bags, lunch boxes, coolers, and grocery totes. Can be used alone or stacked. Lightweight and slim for smaller insulated coolers. Individually, they thaw out quickly, within about two hours. This is one for the boys, well, their beer anyway. Mind you, ladies, you can sneak your wine (or beer!) in there too. Designed for coolers to keep your tailgating or BBQ beverages cold, they can be used for chilling other items as well. These cool packs are sturdy and reusable for any item, up to 100,000 times. This means they will last you for a long time, keeping lots of beer cold. Designed for coolers to take to parties, barbeques, tailgates or on day trips, they freeze at 28 degrees Fahrenheit. When used in conjunction with regular ice, they will keep it frozen up to 50 percent longer. This cool pack also comes in an Alaskan and Tundra series. The Alaskan series holds a temperature of 33.8 degrees Fahrenheit to keep chilled goods cold. The Tundra series holds a temperature of 5 degrees Fahrenheit if you can get your freezer to get it that low. These will flash freeze fish or meat, perfect for hunting trips where you need your meat kept frozen for a few days. Just remember to freeze them for at least 36 hours before using them, and crank the temperature of your freezer as low as it will go. Available in four sizes, 5 pounds, 2.5 pounds, 1.5 pounds, and 0.75 pounds, each pack is 1.25 inches thick. They then measure 11 inches by 8.5 inches, 7.5 inches by 9.5 inches, 7 inches by 8 inches and 6.25 inches by 4.25 inches. Just choose a size equivalent to the weight of ice you would typically use in your cooler. The non-toxic packs are made in the USA and have leakproof caps. Their surface area is maximized for faster cooling. They are available in a range of color choices to match your cooler. Chills beer to 28 degrees Fahrenheit. Rugged container which is UV stabilized. Reusable up to 100,000 times. Faster cooling with a maximum surface area. Handle for easy carrying and removal. Keeps drinks cold for a long time. Take a long time to freeze. Need to turn your freezer very low to freeze the Tundra option. The choice of sizes and cooling options: Chillin Brew, Alaska and Tundra, cover your cooling needs, from food to beer and meat. 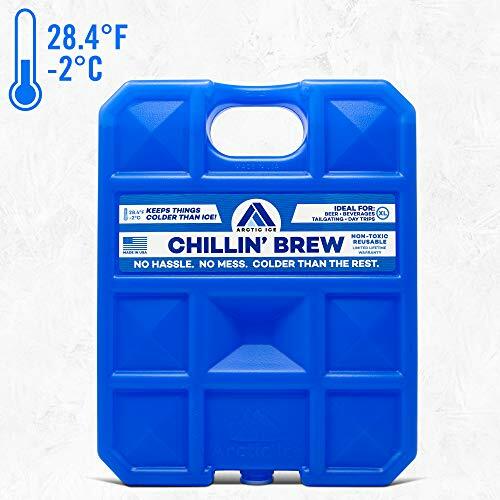 They are ideal for taking on a fishing or hunting trip, or just cooling your beverages for a party, tailgate or barbeque. Most ice packs are too big for everyday use in a small lunch box. You need a smaller option that won’t take up too much real estate and allow you to carry the food and drinks you need. Healthy Packers brings us a lightweight ice pack that will fit in bento boxes, lunch bags and coolers. 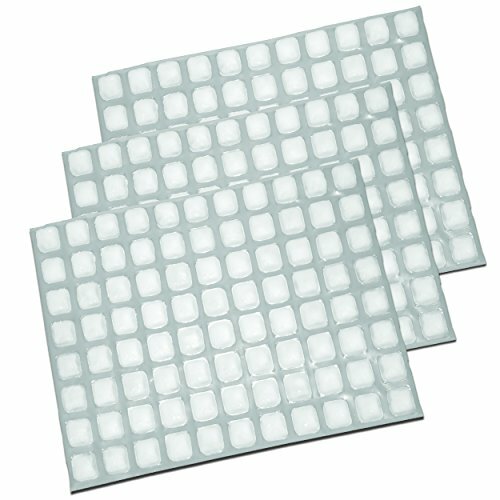 Supplied in packs of four or eight, these hard gel packs are slim and versatile. Measuring 7 inches by 4.8 inches by 0.7 inches, they weigh about 7 ounces each. They will keep food chilled, whether it’s in your kid’s lunch bag or your own packed lunch for the office. The added bonus is they won’t leave your sandwiches wet and soggy. They will also keep a small cooler cold for a picnic at the beach. They are filled with FDA-approved gel, and are 100 percent non-toxic and BPA free. The company stands behind this product, offering a full refund if you are not satisfied. Just email Healthy Packers if you find a problem and they will send you your money back, no questions asked. Measures 7 by 4.8 by 0.7 inches. Slim and versatile for smaller coolers and lunch containers. One pack isn’t really enough to keep food cold. Small and slim, these are a good choice for lunch packs, although you may need to use more than one. Luckily, they come in packs of four or eight. They freeze quickly and are 100 percent non-toxic. Imagine the convenience of ice in your cooler without all the messy water at the end of the day. A sheet with the frozen water contained in small pockets that you can cut to size or bend to fit where you want them could be the answer. These innovative ice sheets from FlexiFreeze are water filled and completely flexible. They come in sheets of 88 cubes, and you can get a package of three, six or 12. Each sheet measures 15.5 inches by 19.5 inches, but here’s the cool thing: you can cut them to any size you want. Add to that the flexibility of the sheets, and you can slip them in your cooler anywhere you need them. Are you always having trouble trying to pack your cooler with awkward objects and chunky ice packs? These may be what you’ve been looking for, simply wrap them around items or cut them to fit. The weight of each sheet is 2.5 pounds. They are slim and will fit easily into your freezer for chilling. Reusable and re-freezable, these ice sheets should give you plenty of use. Some have even found these flexible enough to use as an ice pack on injuries. As well as keeping your goods cool, they can be used in the event of an accident too. Made from 100 percent pure water. 88 ice cubes per sheet. Measures5 inches by 19.5 inches by 0.625 inches. Can be cut to size, to fit where you need. Can also be used as an ice pack for injuries. Need to make sure they are flat in your freezer so all the cubes freeze. The uncut sheets are quite large. These sheets can be adapted to fit wherever you need them, a few strips for a lunch box or a whole sheet or two for a cool bag. Made from 100 percent pure water, if any individual cubes leak, they won’t spoil your food. There is little doubt that a good ice pack is a great addition to your arsenal for keeping food and beverages cold. It’s an essential bit of kit for summer weekends away, camping, tailgating, fishing, or everyday lunch boxes. Whether you choose to use them alone or in conjunction with regular ice, the best reusable ice packs will save you money in the long run. They will also cut down on runs for ice to keep that cooler topped up. More time to chill and enjoy yourself – and no warm drinks. We hope you enjoyed our guide to the best ice packs for coolers. Got any questions or suggestions you would like to share? Please leave us a comment below, we will answer every one. Masterbuilt 30 Electric Smoker Review – Recommended, or Not?